You can always count on Guerlain to make pretty things. Their new La Petite Robe Noire Lipcheek, subtitled Universal Tinted Gel for Rosy Cheeks and Lips, launched for Spring 2017, is no exception. 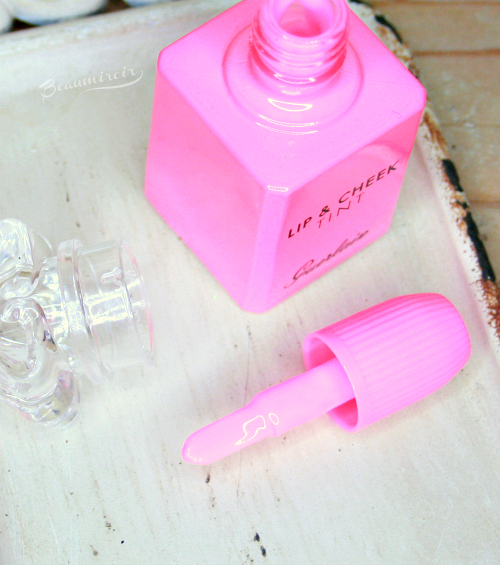 Look at this adorable glass bottle in a hot pink hue! (Because it's so bright it's bordering neon, it confused all my cameras. Look for the picture with the caption below for the most accurate photo). But beyond its good looks, is it worth buying? Let's find out! The cute square bottle is adorned with the signature heart-shaped clear stopper that Guerlain uses across the whole La Petite Robe Noire range, from the fragrance to the nail lacquers. When you remove the stopper, there is a screw-on cap that opens to reveal a brush applicator with rounded edges. The texture of the Lipcheek is a fresh, fluid gel that is easy to spread out and blend over skin. It dries to a non-sticky stain with a natural finish. There are no sparkles or shimmer particles here, and the lightweight product sinks into the skin so well that it completely disappears to leave only a veil of color. 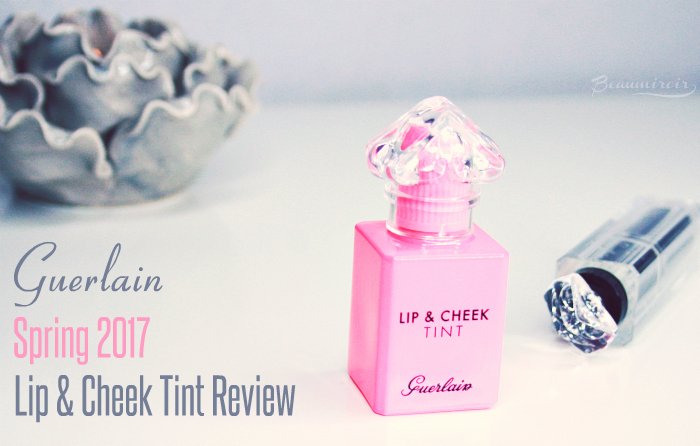 The tint has a rather strong sweet floral scent that reminds me of the La Petite Robe Noire fragrance. Not surprising, but it's powerful enough that it might disturb people who are sensitive to scents, and it doesn't go away after the gel dries down. I personally don't mind my face smelling like sweet raspberries and rose, but if you have sensitive skin you could find it irritating! 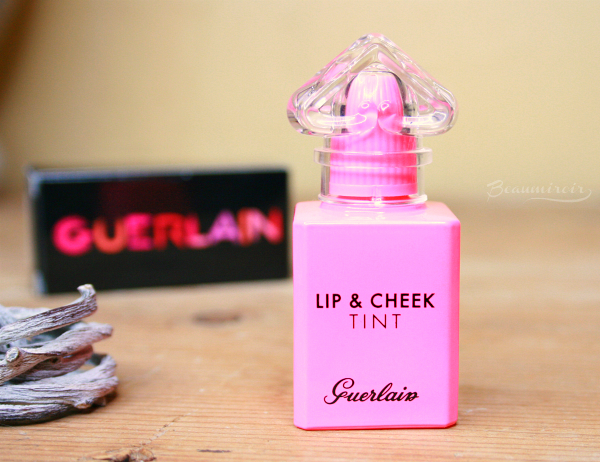 Guerlain's Lipcheek comes in a single shade: a medium-toned, bright cool pink. Despite being distinctly cool toned, I think it works perfectly well on my warm complexion: it gives me a very natural, fresh pinky look. The brand describes it as a "universal tint", but I think it will work best on light to medium skin tones. As soon as I opened the bottle I had a feeling of deja vu. After digging into my drawer, I found exactly what it reminded me of: Benefit Posietint. Because they are both sheer, they're as close as it gets to a dead on dupe. Here are the minor differences: Posie Tint is unscented, the brush is smaller, it's a tad bit cooler, but it stains the skin faster, making it harder to blend evenly (I always get a darker spot right where I applied the brush to my skin). Posietint is also easier to find and cheaper, although not by much ($30 vs $35 for Guerlain's Lipcheek). I find Lipcheek tint very easy to apply to my cheeks as it blends beautifully with fingertips or a synthetic brush. There is a slight cooling sensation for a few minutes, but it doesn't make my redness flare up. Despite being sheer, it's also easy to overdo, so I start with a small amount and add more until I reach the desired color intensity. 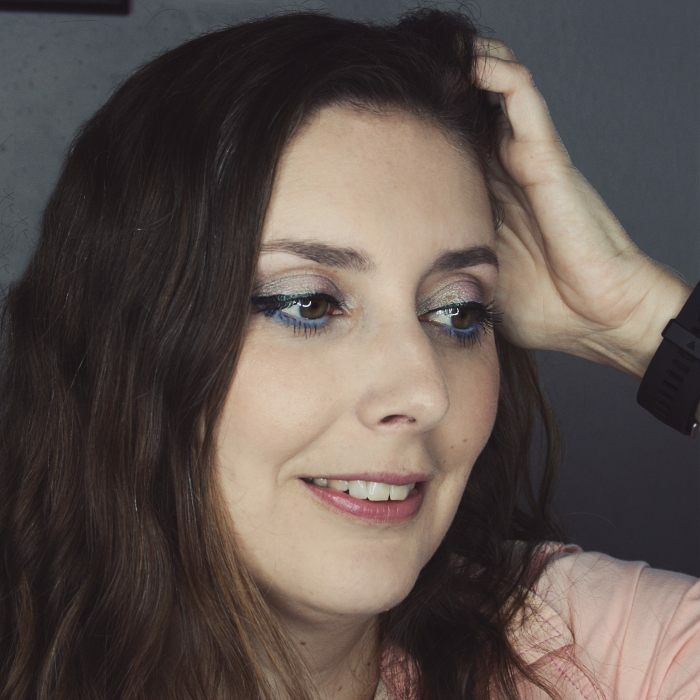 The applicator brush comes out heavily loaded with gel, so I have to be careful not to use all that product and wipe it on the side of the bottle to get just the right amount. Properly applied, it gives me a gorgeous natural flush with zero extra texture on my skin. The first time I used it on my lips, I made the mistake of applying it like a gloss: I used all the product that was on the brush and even dipped it back in for more. Big fail, it dried leaving weird chalky patches on my lips! You have to remember that this is a stain, so it needs to be applied in very thin layers. The best way to do that for me is to get 2 or 3 dots of tint on my lips and spread it out with a finger. Once dry, I apply a second layer. I didn't love this gelee on the lips as much as I did on the cheeks. Although it is non-drying and rather comfortable for a lip stain, it doesn't give my naturally very pigmented lips much more color. It might work better for someone with paler lips! 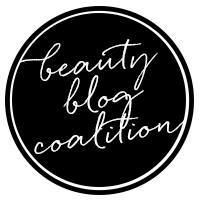 On the cheeks, the tint lasts all day without any sign of fading: you know you have a winner when your cotton pad with micellar water looks bright pink at the end of a long work day! On the lips it was harder for me to say, as I didn't get much color payoff to start with, but it seemed to be gone after a meal. 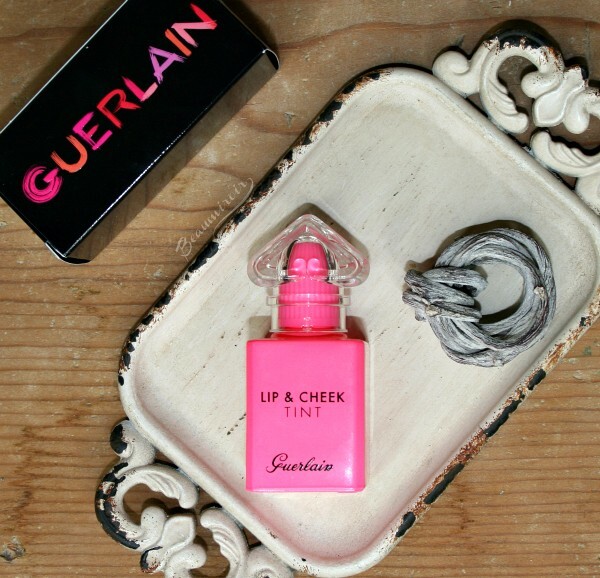 If you like pretty pink things and makeup with a nice floral scent, you would probably love Guerlain's Lipcheek. 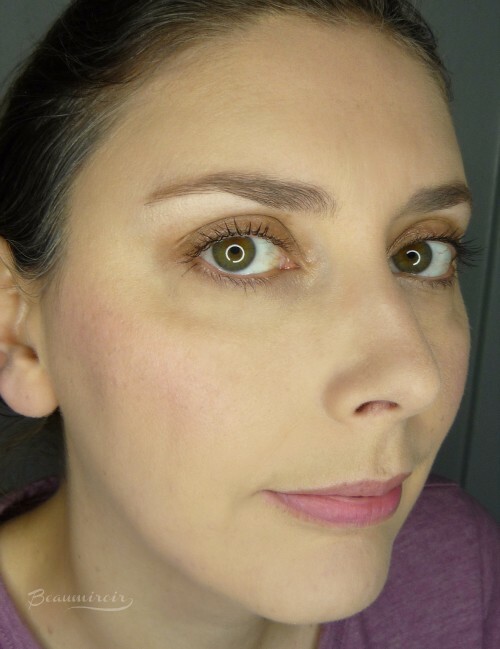 I personally really like it on my cheeks for a natural, fresh rosy look that will be perfect for spring. If you prefer unscented makeup and more affordable brands, Benefit Posietint is a very close dupe! 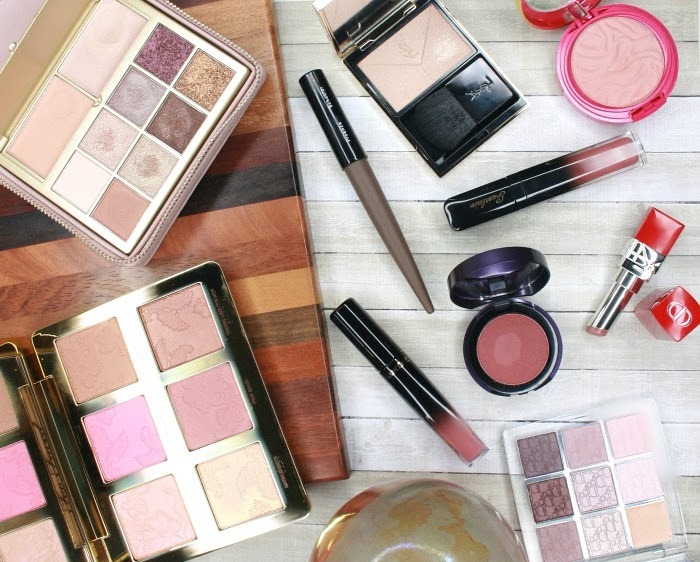 You should also take a look at my review of Guerlain's new Les Couleurs de La Petite Robe Noire face, eyes and lips palette, the latest makeup launch inspired by the iconic fragrance!